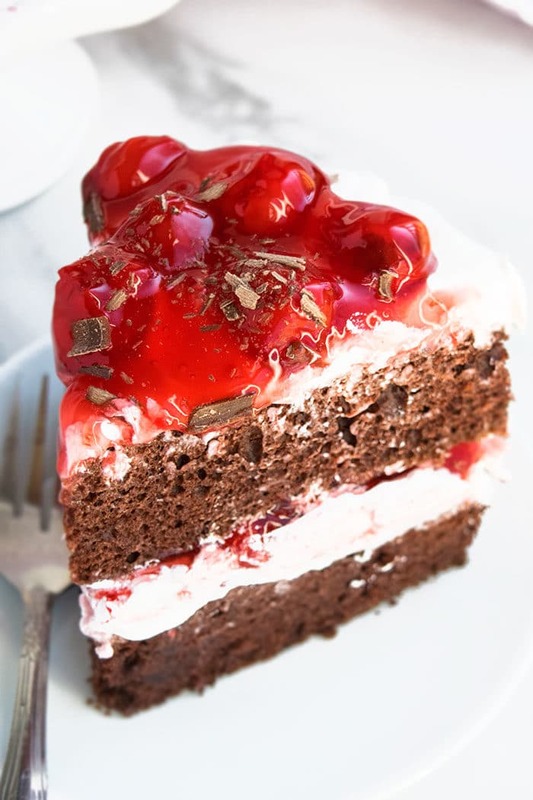 Quick and easy black forest cake recipe, made with cake mix and simple ingredients. 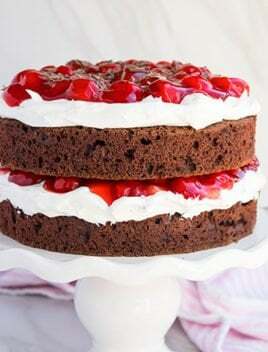 Soft, moist chocolate cake with cherry filling and whipped cream. This decadent classic cake has German roots. 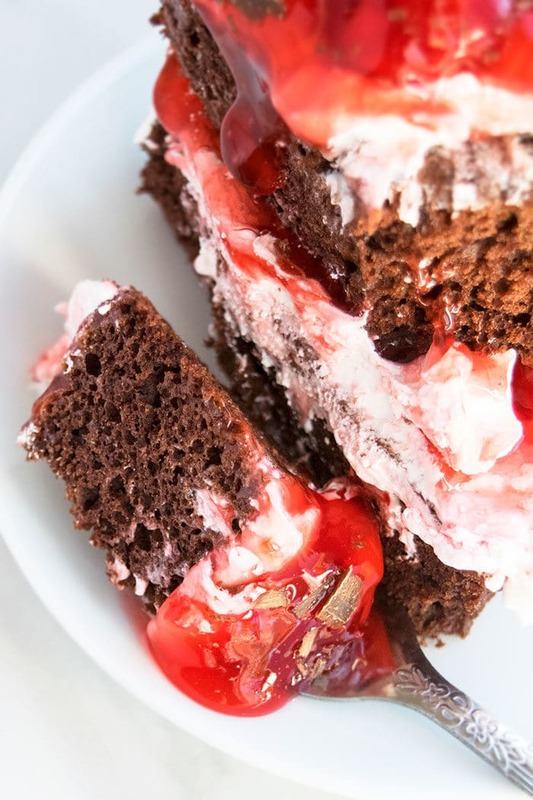 It’s also called a Schwarzwälder Kirschtorte and consists of several layers of chocolate sponge cake, cherry syrup, fresh cherries, whipped cream and decorated with chocolate shavings. However, the modern version many of us enjoy in the United States now has changed. It includes a soft and moist chocolate cake (not necessarily a chocolate sponge cake any more), cherry pie filling instead of fresh cherries and. Also, the alcoholic cherry syrup (kirsch) is usually omitted to keep it kid-friendly. Does German black forest cake have nuts and alcohol? The traditional recipe has alcohol because it is typically brushed with cherry syrup or cherry liqueur (kirsch). However, you can omit this or use a non-alcoholic cherry syrup, if you like. Does homemade black forest cake need to be refrigerated? Yes, it needs to be refrigerated because it’s frosted in whipped cream and has a fruity cherry pie filling and both can go bad, if they sit out too long at room temperature. What is the difference between black forest cake and chocolate cake? Black forest cherry cake is a layer cake, composed of dark chocolate cake, whipped cream and cherry filling between layers. The chocolate and cherry flavors are very prominent. Chocolate cake, on the other hand, can be filled and frosted with any icing or glaze of your choice and does not have a fruity component. 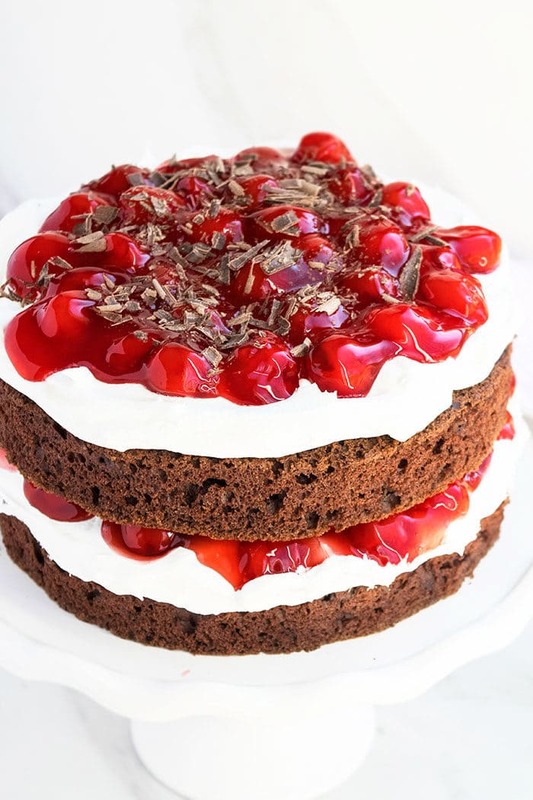 How to make black forest cake at home? Assemble on a cake stand and enjoy. Black forest dump cake- Add a can of cherry pie filling in your favorite chocolate dump cake recipe. The results will be very ooey gooey. 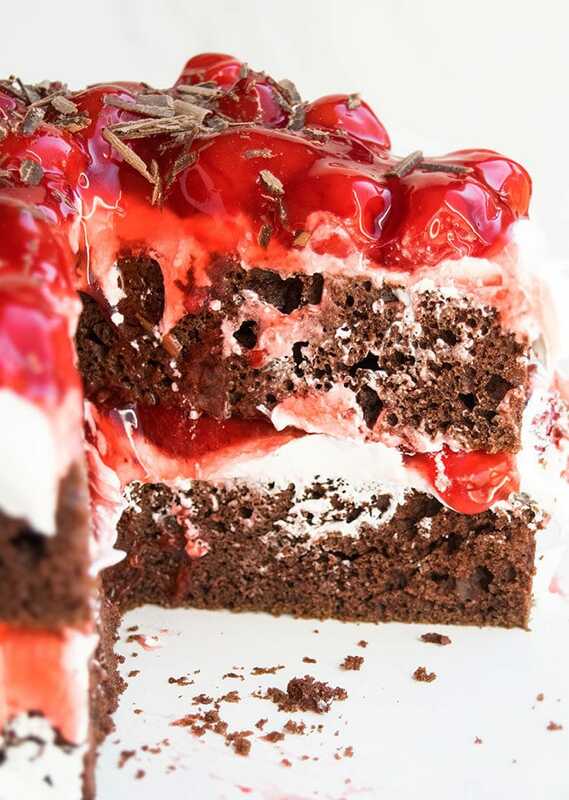 Black forest poke cake– Bake a chocolate cake in a rectangle pan. Poke holes with a bubble tea straw. Pour cherry pie filling. Spread whipped cream on top. Decorated with chocolate. Brand of cake mixes– I have used these brands of cake mixes successfully: Pillsbury, Duncan Hines and Betty Crocker. I have not tried any other generic brands to know how it would affect this recipe. Pudding in cake mix- This adds a lot of moisture to the cake. Don’t use the powder but instead, use the small pre-made snack cups. Butter vs. Oil– Although oil can be used, I feel butter adds a rich buttery flavor the cake. Chocolate shavings- These can be made at home by running a vegetable peeler along a big baking chocolate bar or you can buy them too. Whipped cream– You can use Cool Whip or make it at home by whipping together heavy cream and some sugar until fluffy. Add some gelatin to the homemade version to make it more stable. Refrigerate this cake– Due to the use of whipped cream and cherry pie filling, this cake must be stored in the fridge until you are ready to serve to prevent it from going bad. Decoration– Keep it simple with just chocolate shavings and let all the wonderful layers shine through. Temperature is key– Do not start assembling and layering your cakes until they have fully cooled down or else whipped cream will melt all over the cake and make a sticky mess. 1 container Snack pack chocolate pudding Not the powder but use pre-made pudding, 3.25 oz. In a mixing bowl, add butter, eggs milk, chocolate pudding and mix until smooth. Pour this batter into 2 greased/floured 8×2 round cake pans. Bake at 350 degrees for about 40 minutes or until an inserted toothpick in the center comes out clean. Then, trim the sides and cut the domes on the cakes. Place one cake on a cake stand. Spread whipped cream on top. Then, spoon cherry pie filling on top of the whipped cream and spread it out. Place the other cake on top of the pie filling. Then, spread whipped cream on top again. Spoon cherry pie filling on top of the whipped cream again and spread it out. Sprinkle chocolate shavings on top and enjoy! Lovely! I need a huge slice of this! It would be perfect for a special occasion!